Priced at a competitive $30 MSRP, the RecordDoctor record clamp will make integrators' staunchest anti-clamp audiophiles into believers. 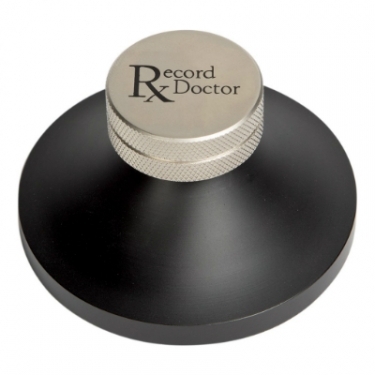 The reasonably priced RecordDoctor can help solve issues with warped or distorted records, as well as nullify annoying scratches and pops. I’m a music nerd. The type of person who can tell you where to find every half-decent bootleg and alt-cover from my favorite bands. So when CE Pro was asked to review the RecordDoctor record clamp, distributed by WS Distributing, I readied myself by breaking out my Pro-Ject Essential III RecordMaster turntable to test the validity of the device. I’ll admit, I’m new to owning vinyl, but that doesn’t make me a vinyl novice. My dad had a vintage Sony turntable throughout my childhood. He didn’t play it often, but when he did … I was immersed. And immersion is a big part of what makes record clamps so great, not to mention they make for a simple add-on sale for integrators, especially to clients who have two-channel listening rooms. Indeed, record clamps are well suited for integrators with online stores and retail storefronts. The clamp could also simply be offered as a memorable gift to a client for whom you have just installed a system that includes a turntable. Record clamps are simple devices: They attach to the spindle of a turntable and put weight on the center of the record, ensuring those little distortions from gaps or pockets of air are minimized. Record clamps are also great for flattening out otherwise distorted or warped records, as I found out after dusting off an old copy of Jethro Tull’s Thick as a Brick from my mom’s collection in storage. For the sake of comparison, I tried playing the record on my turntable without the clamp first—and while it still worked—it was horribly distorted. Ian Anderson’s flute sounded even more eccentric than usual (and that’s saying something)! With the clamp, however, it was a different story. Still not perfect mind you, but darn good. Gone were the stuttering, wheezy waves of unintentionally distorted bass—instead it was replaced with what I can only imagine is a more accurate, closer to studio version of the same recording. The device also immersed me in the stiff whine of George Adams' virtuoso saxophone playing instead of hearing the dull pops of dusty, distorted grooves. I’m not saying that record clamps can work miracles, but for the price point ($30 MSRP), I don’t see why I (or your clients) would ever want to be without a clamp like the RecordDoctor. They're small, inexpensive, and also easy for integrators to keep in inventory or have technicians carry in their vans. It is a great add-on item for any integrator selling turntables or turntable accessories.